Chris Clark, a tall platinum blond blue-eyed 17 year old singer, joined Motown in the mid-sixties. She faced quite a challenge than most of her fellow black artists. Her singles were issued on the V.I.P label, in the USA, her notable songs include "Do Right Baby Do Right", "Love's Gone Bad" and "I Want To Go Back There Again". She had one album Soul Sounds, issued in 1967 for Motown. Apart from having a relationship with Berry Gordy, her incredible voice still manages to capture the Motown and sixties sound, as fresh now as the day it was recorded at Motown. 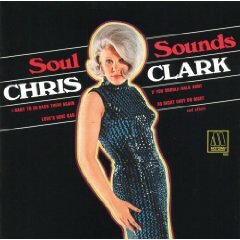 Chris Clark has been compared to the USA equivalent of Dusty Springfield. If you caught her act with the Jack Ashford's Funk Brothers (Jazz Café, London , November 2009) you will know exactly what I mean. The Album has been re-issued by the Reel Music label, for first time as a CD in the USA. The CD with it's 20 page colour booklet includes notes on Chris Clark's career and vintage photos. Issued on Reel Music CD 78010 USA.